If you would like to try our locks and know someone else who would, too, here's a way you can both save money: sign up for our New Customer Referral Rewards Program. 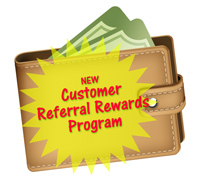 The New Customer Referral Rewards Program is easy to use. It makes an ideal fund raiser for schools, clubs, associations and various not-for-profit groups whose members may not yet know about our products. And, with our unique, unpickable, unbumpable locks and life-time warranties, the New Customer Referral Rewards Program is a win-win situation for everyone. So instead of selling magazines, cookie dough, or popcorn, give this a try! You'll be amazed at how quickly and easily you can earn Referral Rewards! If you have haven't done so already, order at least one of our keyless locks for yourself on our website. When your order arrives, familiarize yourself with the product and how it works so you can tell others about it. Be sure you can point out some of the many advantages. If you are unsure, just refer back to our website where there is LOTS of information. Once we get your request, we will generate a unique Referral Code just for you and email it back to you, usually within 1 business day. Give your Referral Code to your family, friends, employer, customers, church group, club, not-for-profit organization members, or anyone you want. There are no restrictions. Have them enter your Referral Code on our website, either when they first create their account or when they place their first order. Once they enter your Referral Code, they will automatically get $5 off their first order of any lock on our website. Also, you will earn a New Customer Referral Reward of $5 for each new customer you refer, provided that they do not return their purchase under our 30-Day Money Back Guarantee offer. New Customer Referral Rewards are paid on or about the first of each month for qualifying orders place over 30 days ago that have not been returned for a refund. Referral Rewards are paid by check and mailed to the address on your account. You may earn a maximum of one Referral Reward per new customer. Note: if you return your original order (in Step #1 above) under our 30-Day Money Back Guarantee offer, your Referral Code will be deactivated and you will not be eligible to receive Referral Rewards. There are no minimums and no restrictions on who you may refer or what lock they may buy. And these locks work so well, your friends will thank you for telling them about it!